A new exhibition room of JAXA Tsukuba Space Center, which displays various full-scale satellite models. Dr. Nongluck Phinainitisart, President of Thaicom Public Company Limited started that in our interview she speaks about her business strategies passionately for regional and world wide satellite communications system application and introduce her acts as a President and CEO APSCC actively. In this paper, future TV broadcasting, an overview of the significance for SHV transmission experiment, which was carried out in the year 2009 NHK Open House by using the WINDS satellite, and research efforts for commercialization of 21-GHz satellite broadcasting will be presented. 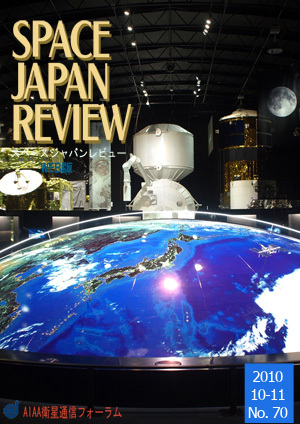 Publisher: Japan Broadcast Publishing Co., Ltd.
A new "Space Japan Book Review" will introduce books, which have become topics in the Editorial board meeting, from a perspective of satellite communications researchers and engineers. The first review a book of Sputnik, which decorate the beginning of space exploration activities. As the sixth and the final article of the series of satellite commentary, "Launch of SKY Perfect" is written by Kazuhiko Hashimoto. Many thanks for his writing one year. We have interviewed with Dr. Akio Iso about Ka-band satellite communication services and technologies for emergency communications in natural disasters. Yasushi Horikawa, a former president of AIAA Japan Forum on Satellite Communications (JFSC) and a former executive director of the Japan Aerospace Exploration Agency (JAXA), will head the U.N. Committee on the Peaceful Uses of Outer Space (COPUOS). . He will report the launch of the QZS-1 satellite, which was launched in 11 September 2010 from Tanegashima, Japan, the history of this satellite, and the position in the world satellite business. APSCC 2010 Satellite Conference & Exhibition held in Convention Hall, Hilton Hotel, Shinjuku, Tokyo from 5 to 7 October, 2010 will be reported. The 28th AIAA International Communications Satellite Systems Conference (ICSSC), which was held in Anaheim, FL from 30 August to 2 September 2010, is reported by NICT's researcher Dr. Amane Miura, who participated in this conference as a speaker. "The National Institute of Information and Communications Technology (NICT) organized an international workshop called Ground-to-OICETS Laser Communications Experiments 2010 (GOLCE2010) in Tenerife, Spain, through which recent trends in the research and development of laser communications in space were reported." This paper presents the trends of space laser communication researches through the presentations in GLOCE2010. What's the difference between satellite communication and space communication? ?